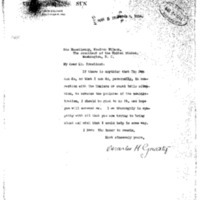 Charles H. Grasty writes to Woodrow Wilson offering any necessary assistance in a variety of matters. If there is anything that The Sun can do, or that I can do, personally, in connection with the Mexican or canal tolls situation, to advance the policies of the administration, I should be glad to do it, and hope you will command me. I am thoroughly in sympathy will all that you are trying to bring about and wish that I could help in some way. Grasty, Charles Henry, “Charles Henry Grasty to Woodrow Wilson,” 1914 March 3, WWP18394, First Year Wilson Papers, Woodrow Wilson Presidential Library & Museum, Staunton, Virginia.